It is too early to assume the recent sky events that had been reported from different places of Sikkim are mere faux news of some extraterrestrial show up. No such explanation of those flying objects being sighted had been found. Yet it remains mystery for those who had come across it and even for those who gossips around it. So are we being watched from sky? The mystery further increased when a student from Sombaria came with the photographs of some unknown spherical object moving around the hills of Sombaria on November 26, 2009. He told “The said object flew bit slowly while they came out from backside of mountain, thanks to god that I was capturing a scene of mountains and the object appeared in my camera aperture. I clicked it; they were five of them moving towards border side of Nepal where they little later disappeared. I never heard any sound nor did I see any white spots behind them”. All thanks to Voice of Sikkim’s website campaign that they had started a sms alert after the first sighting of the unknown flying object few days back across Sikkim to gather any information of certain irregular happenings at sky. The interesting thing is that the two photographs of the objects seem different from one another. If one photographs show a thick white straight smoky lines that vanished into the sky, the other photograph from Sombaria show some spherical objects hanging on space. The story of “Sikkim sky show up” all started on November 12, 2009 when at the noon time, the people of Namthang reported of watching some object at the sky that left behind some thick white cloudy trails that vanished into the sky. The object came with a huge sound that even had a minor trembling at nearby regions. The state of Sikkim heard about this unknown object when it was first reported from Ravangla in the local newspaper on November 23, 2009. The same day the people of Namthang, Singtam and even Gangtok reported of having seen something in “white” on sky that moved in a straight line with cloudy trails, which finally disappeared into the sky. 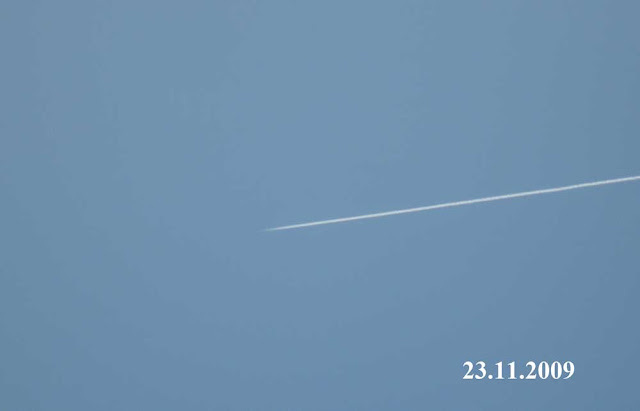 Subbiah, a teacher from Namthang told on the 23rd of November, the white line in sky that passed by Namthang was seen by the students and teachers of St. Paul School, a private school at Namthang. Mr. Samuel, Principal of the school was lucky enough to click the photographs of the thing that went by with a huge bang with scores of white cloudy lines following it in a clear blue sky. He had also clicked the object on its earlier visit a week back but it was not completely visible. 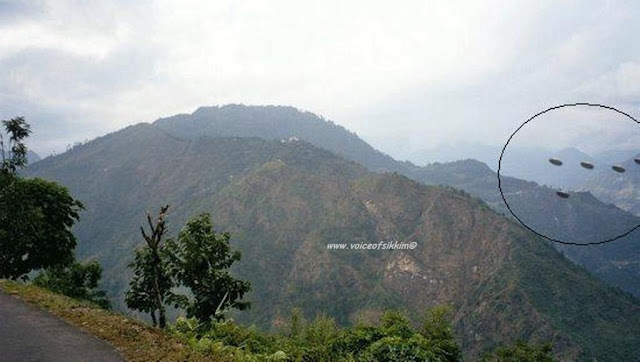 Man Bahadhur Tamang, a teacher from Burung Primary School, near Singtam told that he along with his other teaching staff saw a “white object” moving across the opposite hill to the other end of the hill in a great speed at the noon of 23rd November, 2009. The object came with a big sound that reminded him like some noise of a blasting of rocks that usually occurs in the nearby repair work of road. The object was a "white thing" that moved in a straight line from the opposite hills of Upper Sumin Linzey through the hills of Sang. The total length of the object that was leaving some cloudy smokes from its tail was around 5 km long, said Tamang. Prashant Pandey, a student from Singtam was another person to have seen the “thing” but only could click photographs of the white smoky clouds that was in a without delay following something of its own. According to Prashant, he did notice some faintly spherical object at its tip of the cloudy trails that was revolving in a speed his camera could not catch. Nirmal Mangar, a media personality from Gangtok was one of the other witnesses who did saw that “object” from Nayuma Office, Tibet Road. He saw some long tail like object flying over the sky. With the reports gathered from eyewitnesses, people around are coming with their own conclusion. Some believe it to be some comets that crossed the earth surface, while others speak of some weather testing materials from China. Rumour is also running high that the “thing” could be some Indian Air Force Space craft. But it is still too early to come to a conclusion about what those “thing” was. It is commonly believed that comet does not have sound while if it was something of Air Force testing something in this part of regions that is not often heard. It should have also returned back after sometime but the “thing” that was seen never returned back in same route. Usually any space materials moving along the earth moves in and around the atmosphere surface but this “object” was close to the top of the hills that it passed by. A question does arise if the “thing” had been send from neighbouring country for some geographical tests or other why was it not reported in any press releases. 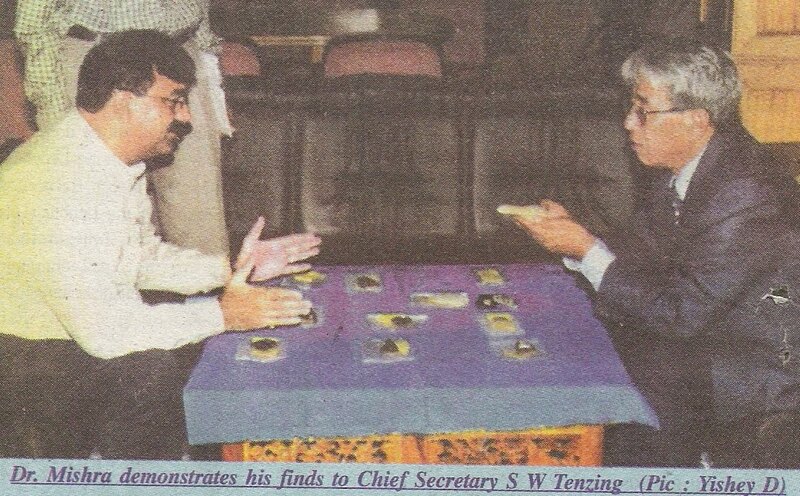 Here I want to conclude from an incident that occurred few years back in early 2000 published in Weekend Review, a weekly newspaper from Gangtok. The newspaper had reported of two green people (?) visiting a house in North Sikkim for two continuous days. Nothing was known about them and nor did they appeared again!! There is something going on in Sikkim’s skies!!!! After a little while the teachers came back. Mr. Pakianathan wanted to recharge his mobile voucher and he handed me Rs 500 note. It wasn’t easy to locate an ‘easy recharge mobile shop’ in the nearby locality of Hotel Tibet. Yet just near the SNT office, I found one shop that could do easy recharge. Due to roaming facility I suppose, there was only Rs 100 balance left when I easy recharged the mobile number with Rs 300. It took me around 10-15 minutes to return back to the Hotel, by then the host and guest was comfortably sitting side by side sharing affection of old days. I sat on one of the sofa near the window with the partly hidden Mt Kanchenjunga facing my back. I was closely watching from behind the old fellows in their own world of the late 60s. 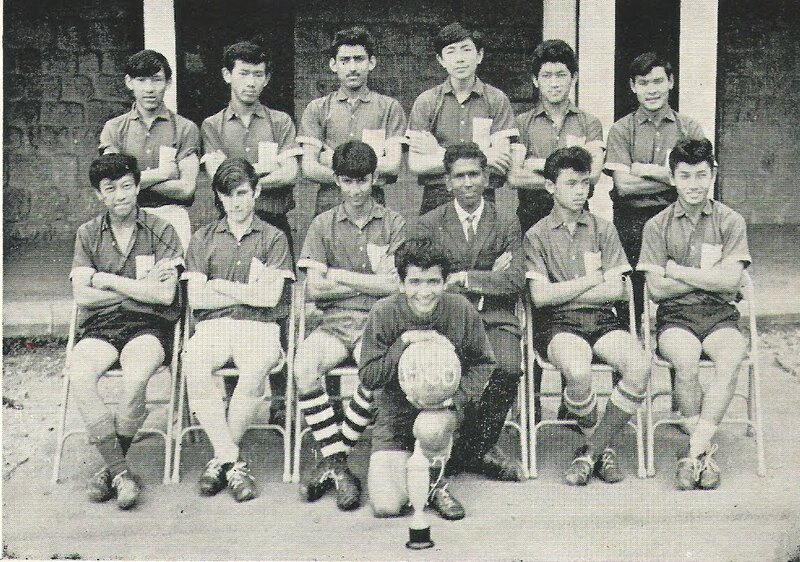 Dhaba had brought Xerox copy of “The Alwynian”, annual school magazine of Wynberg-Allen School that had photographs of his schooling days and shared with his teachers. They talked about those days, those students, those colleagues and there were two of us myself and Dhama just giving an occasional smile when we were given a momentary look. Tea with biscuits were served to us at the hotel but I was more into those faces of persons sitting opposite to me who came all the way from London to spend some happy moment in Sikkim. Mr. Pakianathan would talk “Oh! Ganashyam”, in his UK ascent he was a nice student, a leader of a Gardening Club and a sports enthusiast, in reply Dhaba added what I am today is all due to Mr. Pakianathan’s lesson of mathematics and his morals. Mrs. Pakianathan, Dhaba’s social study passed on a smile whereas Mr. Firth too added his views on Dhaba in his couple of year’s stint as a teacher at Wynberg-Allen School. Mr. Firth, in his light golden hair looked more of a Hollywood actor rather than a teacher much happier visiting Sikkim. 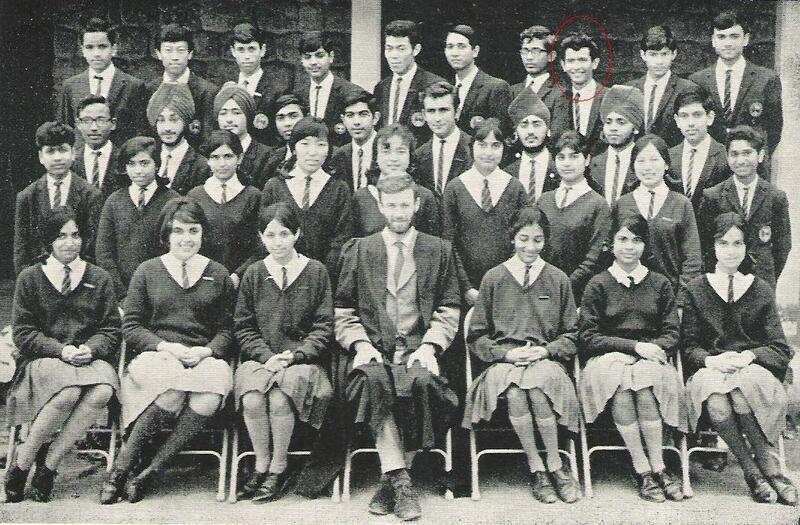 He was to India for the first time after he left Wynberg-Allen School, Mussoorie in late 60s. For Pakianathans it was their second trip after they left Mussoorie in 60s. All of a sudden the topic of conversation shifted to “Gundruk”, yes you heard me right and Mr. Pakianathan recollected his memories of Gundruk, which he in his own words told “He (Dhaba) brought me a sack of Gundruk from Sikkim once and it was Gundruk all the week till it was finished” and we all laughed. In the meantime Mrs. Pakianathan sitting on the opposite side of us invited Dhama to look upon her video camera to let her introduce to her daughter who was settled in Sydney. She was letting Dhama watch one photograph after another and Dhama was just nodding up her head in response to her exchange of words. I was watching everything as one watch over in a silver screen, I could see the enthusiasm and shine in Dhaba’s face and I could read his mind as he was preparing to come out with every thought possible of those days to make the noon-time more momentous. 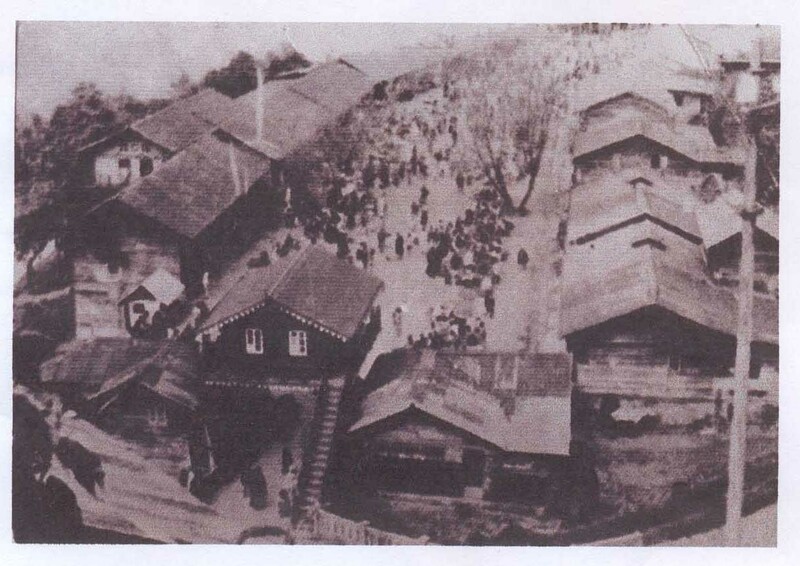 He also had brought along with him old Wynberg-Allen School day’s photographs from his album that had the groups of Sikkim. He showed it to Mr. Firth and he was able to identify few of them. Well little knowledge of information for all, Ghanashyam Pradhan was among the first 8 students to have got a Sikkim State scholarship to study outside Independent Sikkim. Joining him at Wynberg-Allen School, Mussoorie were Prem Das Rai, present Member of Parliament from Sikkim and Mingma Bhutia Senior SP Check Post residing at Gangtok. Mingma Bhutia ‘Sir’ needs a special mention here, it was of his kind generosity the small get-together of the Alwynians was made possible and he even hosted a Dinner for the guests. 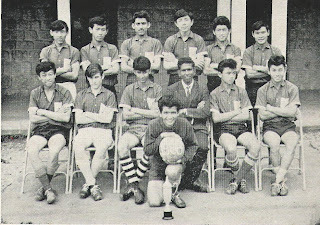 Other students to join Wynberg-Allen School in the 60s included Tej Rasaily, Gopal Rai, late Janak Kumar Chettri and others. In the mean time Dhaba also made her daughter Pramila Pradhan and his brother LN Pradhan talk with his teachers in mobile. The wheel of clock was turning around and couple of hours went by in a whisker of laughters and nostalgic moments. It was time for us to leave, we exchanged our greetings and left Hotel Tibet with thought that we would be in touch with each other through letters and mail that I had noted down in my note book. I was to drop Dhaba and Dhama at Parakha and return back to Singtam with Pranay. It was already late evening when we reached Ranipool; the shops at Pakyong bazaar were bright with lights when we crossed it and finally it was a full moon showing us way till we reached Parakha. After having our dinner we made our way back, just few kilometers from Parakha is a small village called Linkey where one of my old school day teacher lives. Raju Thapa, but we fondly call him Raju Sir; he is running a private school out there. I do make it a point to visit him whenever I go to Parakha and this time around it had been 4-5 years long that I had not come across him. After a cup of hot tea, we made adieu and was on our way back to Singtam, with a wonderful day behind to be remembered for a long time. The above photograph had been clicked by Prashant Pandey on the noon of November 23, 2009 from his house terrace at Singtam. Though the cloudy lines left by celestial object can be faintly noticed ( in between the two red lines ), such rare occurrence was never heard in this part of Sikkim. In the last few days some strange show ups at sky had been reported in different parts of Sikkim that includes places from Namthang, Ravangla and the sighting of five UFO like objects at Sombaria on November 26, 2009. Man Bahadhur Tamang, a teacher from Burung Primary School, near Singtam told that he along with his other teaching staff saw a celestial object moving across the opposite hill to the other end of the hill in a great speed. 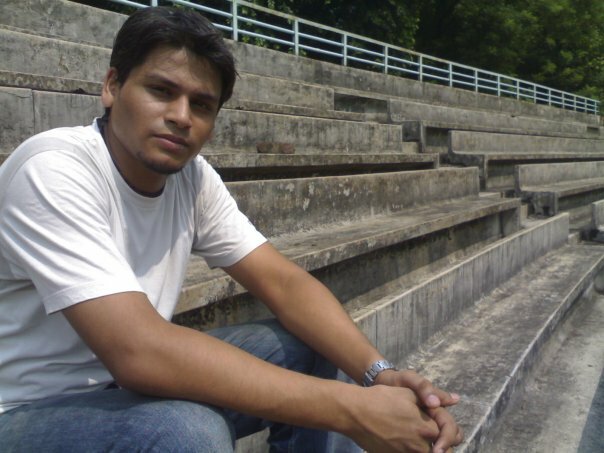 at the noon of 23rd November, 2009. The object came with a big sound that reminded him like some noise of a blasting of rocks that usually occurs in the nearby repair work of road. The object was a "white thing" that moved in a straight line from the opposite hills of Upper Linzey through the hills of Sang. The total length of the object that was leaving some cloudy smokes from its tail was around 5 km long, said Tamang. The same incident was also reported from Ravangla. It is also connected with UFO but not smoke leaving UFO space craft had been ever heard off. The thing is also referred by some common men as a comet, but it is more than strange that no sighting of comet is recorded in any other part of the globe on that particular date. 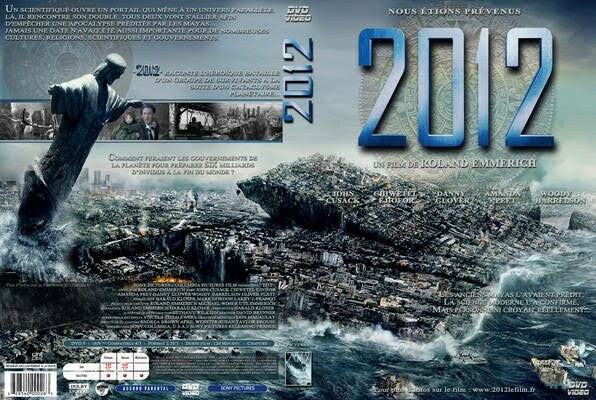 When i was watching the human race passing on to its end before the big screen on Denzong Cinema Hall, my heart was asking me will "2012" really take place. I was telling myself, I love you Dad. I was crying within myself. I wish everyone who love their loved ones should watch this movie ones. The plot and the characters of the movie make us believe what we might face if all the rumours are to be believed. In acting front i am impressed with one man....the fat Russian billionaire Zlatko Burić, he did his work with an ease. But without any doubt the hero of the film is the director, screenplay and the visual effects. In one of the scenes a lake is seen disappeared in Yellowstone, USA and was converted into popping bubbles of hot gases. This did reminded me of number of lakes that had disappeared into the earth crust in Sikkim itself in last few decades. Not to forget the one that happened last year in west Sikkim!!! Shiva Thapa, a junior world number two boxer from Assam, India was felicitated in Mumbai Boxing Association at Mumbai on November 22. Shiva is leaving for Baku to participate in A.A.Argalov Cup International to be held on December 2 to 8, 2009. He will fight in 54 kg bout. 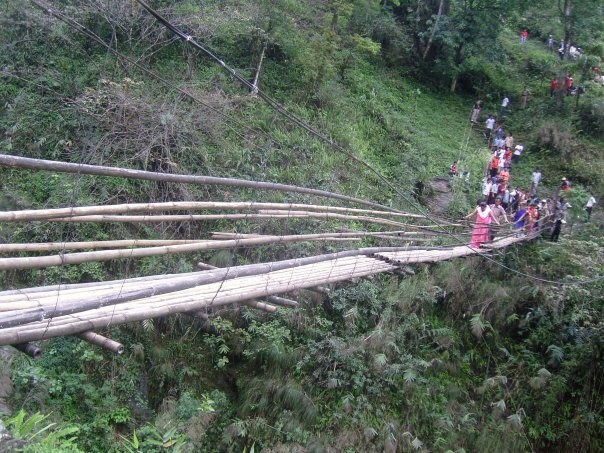 This bridge on the way between Lingee to Sokpe in Sikkim. 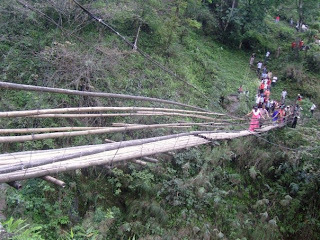 Labels: bridge, Lingi, Sokpe in East Sikkim. Kalimnews (with additional inputs from Times of India): Breaking the world record for longest play, the artistes of Prerna Kala Manch (PKM) succeeded in setting a new world record by staging a series of marathon plays for over 33 hours at Nagari Natak Mandali Auditorium, Varanasi on Sunday evening. It may be recalled that `The Warp', written by Neil Oram and directed by Ken Campbell is listed in the Guiness Book of Records as the longest play of the world. It was written as a series of 10 plays but performed in one continuous marathon. In this play that was staged in UK in late '80s, around 30 artistes lived about a hundred characters in 29 hours. The PKM artistes including Bhola Singh Rathore, Vivek Gupta, Harish Pal, Ajay Roshan, Mukesh Jhanjharwala, Dr Awanish Dwivedi, Aslam Azad, Ajay Thapa and Dhan Ratan Yadav, staged 37 plays in a series that took a time of 33.5 hours to complete under the direction of Moti Lal. Their only musician and singer Deepak Pandey performed without a break. Though some of these artistes suffered from cold-cough, throat irritation, backache and itching of the eye, they never let it stop them in their goal and a team of seven doctors monitored their health condition continuously. More surprising was the presence of audience to watch this marathon event. More than 50 theatre lovers enjoyed the event the entire night while in the day and evening hours, maximum seats of this auditorium remained occupied. The atmosphere became jubilant with the beginning of 34th play `Ek Aur Ek' as with it the earlier record of 29 hours was broken. Father Pranoy of Vishwa Jyoti Jansanchar Samiti, the organiser of the event, said: "We are proud to have given a record breaking performance in Varanasi." 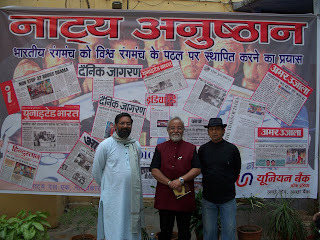 The series of marathon plays started at 11.02 am on Saturday with Amanat, based on communal harmony. 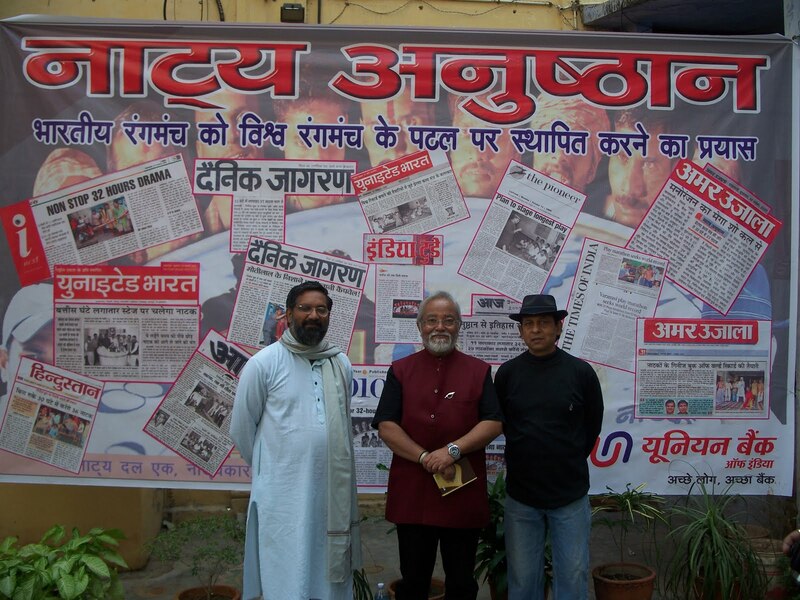 All the plays touched social and various other issues like 'Dunia ka Mela' based on fellowship and love. The artistes raised the issue of corruption with their play 'Gandhi Ne Kaha'. Followed by 'Bure Kaam ka Bura Natija' (on the issue of superstition), 'Maiku' (alcoholism), 'Hai Re Pani' (natural resource), 'Parivartanam' (conversion), 'Sayit Sagun' (untouchability), 'Panch Parmeshwar' (Panchayati Raj), 'Sapna Sajal Ba' (self-rule), 'Kala Badal' (environment), 'Kya Kare Kya Na Kare' (pre-natal care), 'Jab Jago Tabhi Savera' (education and development) and 'Daud Daud Daud' (globalisation). Two plays 'Do Boond Zindagi Ki' and 'Pyar Ki Chhaya' that were staged after mid-night were based on health issues. 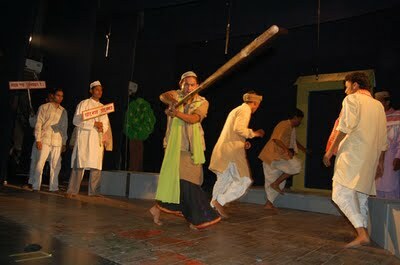 The artistes raised the issue of National Rural Employment Guarantee Act with a play `Sathi Hath Badhana'. 'Raja Nahi Seva Chahi' (Panchayati Raj) and 'Ghoos Ko Ghusa' (right to information) continued till wee hours. These plays were followed by 'Lagan' (based on the theme of education), 'Sui-Pani' (health), 'Kal Ka Samrat' (child labour), 'Dal-Dal Par Jaan' (environment), 'Punarmilan' (youth problems), 'Bolte Kyun Nahi' (duties of citizens), 'Satyapath' (fight against corruption), 'Asli Dhan' (consequences of greed), 'Badhiye Aur Bhadhaiye' (girls education) and 'Girohband' (politics). Despite completing 24 hours of continuous performance the artistes kept the audience entertaining as loud applause could be heard when 'Kafan', based on the issue of Dalit development and story of Munshi Premchand was performed. It was followed by two plays on the theme of communal harmony `Hinsa Parmo Dharma' and `Purvagrah'. Importance of girl education was highlighted again with the plays `Kamla Ka Kamal' and with the beginning of `Ek Aur Ek' these artistes left the record of over 29 hours marathon plays by British artistes behind. Their effort to set a new milestone started with `Bhagwan ki Den' (based on the issue of family welfare). The last two plays Sava Ser Gehu based on the issue of bonded labourers and 'Prem Ki Boli' on the issue of fellowship and love not only helped making the conclusion of marathon plays memorable but artistes also made audience emotional with their performances. The opening ceremony of this historical event was witnessed by C.K. Shresthan, Natyabhushan, a reputed name of the Indian Gorkha theatre as chief guest in presence of other prominent theatre personalities of India. Swami Anil Dev, Father Aanand, S.S. Ganguly, Dr. Anand Tiwari, Chairman, Pragatishil Lekhak Manch, Father Subash were other guests in the occasion. While addressing packed audiences in the hall, Shrestha thanked the organiser of the event for inviting him and stated that this was a recognition to the Indian Gorkha theatre. He claimed that this would definitely add more energy to the theatre groups in Darjeeling hills and other parts of India where the Nepali speaking Gorkhas are engaged in theatrical works. Roshan Prasad, 23 yr old from Singtam, Sikkim pursuing his Charter Accountant studies from Institute of Chartered Accounts of India at Kolkata was interviewed in Aakash Bangla Channel, a local TV channel from Kolkata for his collections on cricket and football memorabilia. The program was aired on November 13th at Bengali sports program “Khel at 11”. Talking from Kolkata, Roshan told it was a pride moment for him to get such appreciation. Roshan is a budding philatelist from Sikkim whose collection on cricket theme has attracted wider admirers. His philatelic materials includes a rare withdrawn Bangladesh postage stamp with the unsanctioned ICC logo and second oldest cricket stamp of the world from Pakistan issued in 1962. Also included in his collection is an Official envelope of the Calcutta Cricket and Football Club which is the second oldest Cricket club of the world after Marylebone Cricket Club (MCC). 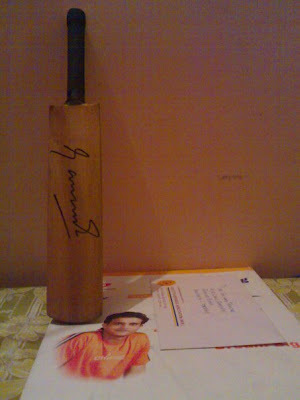 Another item of value in Roshan’s unbelievable collection is the medal of honour which was presented by the Cricket Association of Bengal to the former cricketers during its Golden Jubilee celebrations in the year 2005.This was gifted to Roshan by a former cricketer of Bengal Mr. Dipankar Ghosh. Roshan is also designing a “Special Cover” for Mohun Bagan AC to Commemorate 100 years of its IFA Shield triumph over East Yorkshire Regiment. He has received appreciation letters from the National Cricket Academy, Cricket Association of Bengal and Mohun Bagan AC. He has also received official envelopes of the Tata Football Academy, Mohun Bagan AC, East Bengal, Mohammedan Sporting Club and Press Club of Calcutta. Even official letters of Indian Sports channels like Zee Sports and ESPN Star Sports grace his collection. 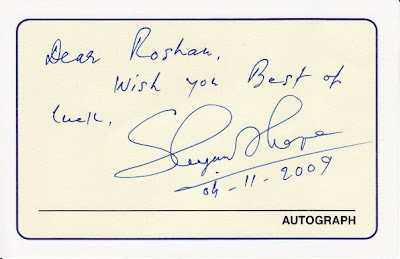 His autograph collection of players like Bhaichung Bhutia, Shyam Thapa, Surav Ganguly and others is his biggest pride, told Roshan. When I first heard that my Dhaba (my father’s elder brother) was having a small reunion with few of his teachers of Wynberg-Allen School, Mussoorie out at Gangtok after 41 long years, I could not stop myself from asking him to take me along to be part of that precious moment. I was happy he did not denied me but there was many thoughts going on my mind while we were on the drive to Gangtok from Singtam. Believe me when I say that Dhaba came all the way from Parakha, his residential to pick me up along with Dhama ( his wife) and Pranay (his son). Dhaba was in high spirits looking forward to meet his teachers all the way from London. I was excited and curious to know as well as how shall the duo of student-teacher (I mean Dhaba and his teachers) react at their first interaction after more than four decades and what shall be their talks. All these different thought made me busier till we reached Hotel Tibet at the heart of Gangtok, where those people had been staying out. We even had bought pickles as a reminder from the guests from the Pick-Up Shop of Singtam Juice Factory. My Dhaba, Ghanashyam Pradhan, lovingly called ‘GS Sir’, by one and all is a retired former Headmaster of Phadamchen SSS. An educationist with vibrant thoughts that was shown in his teaching days had been the trademark of his more than two decade long illustrious profession. He enjoys his retire life out at Parakha, a few hour drive from Pakyong with his grandchildren and contributing in certain social gatherings. But at anytime if one mentions him about his staying at Wynberg-Allen School, he does not make a gimmick in sharing off his best years of his life. I had always admired the English ascent and the fluency he had and without doubt all thank to Wynberg-Allen School, those teachers, friends and to that atmosphere for it. Coming back to Hotel Tibet, it was already mid-noon when we reached there and we were told that the guests from England was on the way from Changu Lake accompanied by Mingma Bhutia, an another former student from Sikkim and was about to arrive at the hotel within few minutes. All the way I had been listening up name of one of the teacher more often, his name was Pakianathan. I was fumbling off with the pronunciation of the name and giving up a thought that he might be some old guy from South East Asia, somewhere between Malaysia, Indonesia and nearby those countries. The moment finally arrived when an Indian looking 60 plus gentleman entered from the entrance door of the Hotel Tibet and Dhaba went to greet him. He gave his introduction and in between their talks I could make up my mistake that the very Indian looking person was Mr. Pakianathan himself not to do anything with my geographical speculation! Watching both of them hug was something you don’t often come across. Watching Dhaba having a stick to walk, Mr. Pakianathan was surprised and teased Dhaba grabbing his stick? 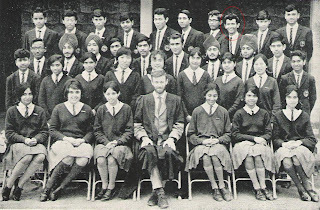 Few minutes after him followed an Indian lady; she was Mrs. Pakianathan who was also Dhaba’s teacher at Wynberg-Allen School and then finally few foreign faces. Among them included Mr. Firth, Dhaba’s English Teacher with his wife and fellow friends. They made us take a seat at the sofa and left for some fresh up. I was watching Dhaba being restless could be that he was preparing within himself about what to speak of all the years. It might be about excitement of meeting his old teachers that could not be hidden from his face. 6. The early years of SNT……. 12. 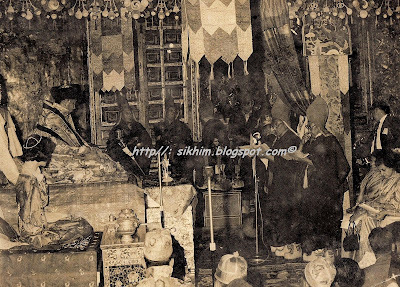 What is Sikkim History all about? 16. Can it be a Sikkim Primitive…! 17. Those early man tools found in Sikkim! 20. Thy name is Sikkim! 31. When Volleyball ruled Singtam!! 36. What does this stone tablet mean? Pankaj Sir's bhalu is funny !! Who is she -4 ?